Wandering City Blues: WCB Pre-Orders / Promo Poster. WCB Pre-Orders / Promo Poster. Hey friends! It's been a hell of a month since finishing Wandering City Blues, despite the blog being a little on the quiet side. On the personal side of things, my wife and I found out that our new baby is going to be a boy, our daughter's school year started up again, I had some minor hand surgery yesterday and starting tomorrow my brother is coming to visit for a couple days so I've been prepping for that. Professionally it's been a wild ride too. I've been working with my friends Matt Carroll and Mansa Herndon on MJM - A Fogworld Radio Drama (some of which you've heard by now). Of course I ordered and reviewed proof copies of Wandering City Blues a couple weeks ago, made some changes and approved the final version for sale. It will be up on Amazon sometime during the week of October 24th. I also have the first 150 copies of the book itself coming in the mail (they're currently in Portland, OR, by the way). 1. Go to ACarrierofFire.com and click the PayPal button to send $20 USD our way. That's $15 for the book and $5 for the cushioned mailer and postage. 2. If you have any special signing instructions/requests, email me at jonny.lupsha@gmail.com IMMEDIATELY with the name on your order and your request - for some reason no matter how many times we make the PayPal button the "Special Instructions to Seller" field won't populate. Otherwise I'll just make up something nice when I sign it. 3. Please allow like a week or so for delivery after the books get here in the mail. 4. 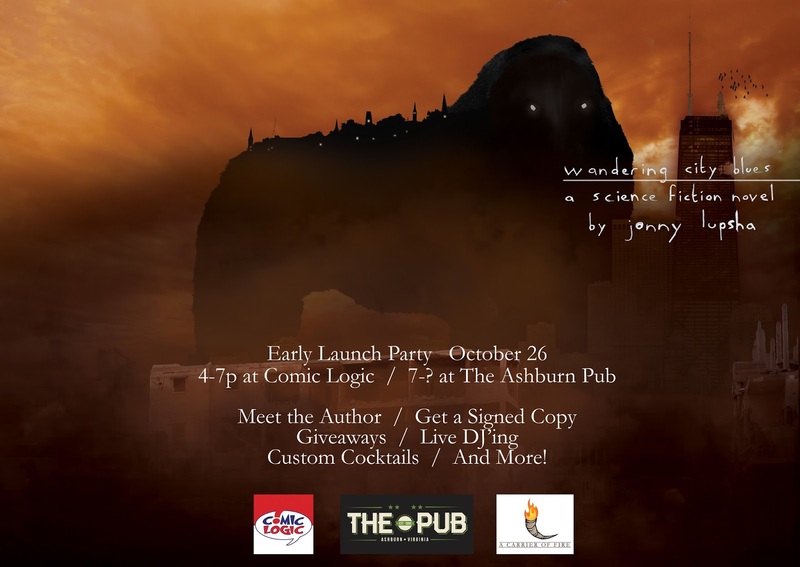 Alternatively, if you plan on attending the local launch of WCB at Comic Logic and The Ashburn Pub in Ashburn, VA, on October 26, or the Virginia Comicon on October 29-30, you can email me any time or message A Carrier of Fire on Facebook and ask us to hang on to a copy or two for you, and we'll figure out payment at the event. The good news is that I should get the books in the mail next week (September 26 or 27), so if you pre-order from me any time before maybe October 20, you should get your copy well in advance of the official street date of October 29. Finally, we have a promo poster for the aforementioned October 26 launch party in Ashburn. Feast your eyes, share on your social media page of choice, tell friends etc. Thanks!